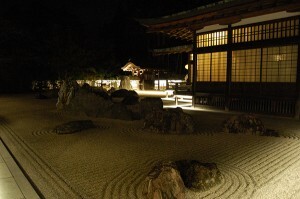 I went to Wakayama to see the nighttime lighting of the Banryutei garden of the Kongobuji temple, which I mentioned in my previous post. Admission was permitted from 18:00 in the evening. I saw dimly lit lamps in cold silent darkness. Where there is light, there is a shadow. And where there is a shadow, there is light. The space was arranged in a way that allowed the visitors to feel the existence of light and shadows. 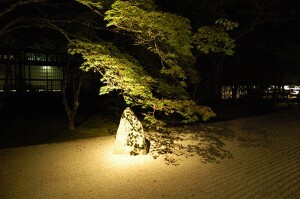 The garden was lighted up at 18:30, as shown in the photos below. We all erupted into applause automatically. In the stone garden, there were two dragons sitting across from each other. 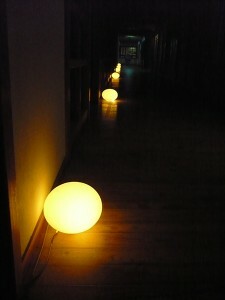 I took this photo on the corridor leading from the main shrine to the Banryutei garden. It was in early October that I visited the temple. In late October, the leaves on this maple tree would have turned red. It was so difficult to take good pictures of this beautiful scene. Walking in a quiet place in clear autumn air, I noticed things that would normally not come to attention, such as the sound of insects singing and the smell of air. 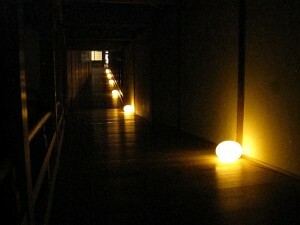 Inside the lamps were LEDs, which flickered like a candle flame. 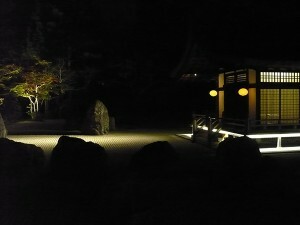 The lighting event of the Banryutei garden was produced by illumination designer Hiroshi Nagane of Tokyo Design Party. See the PDF file attached at the beginning of this post.